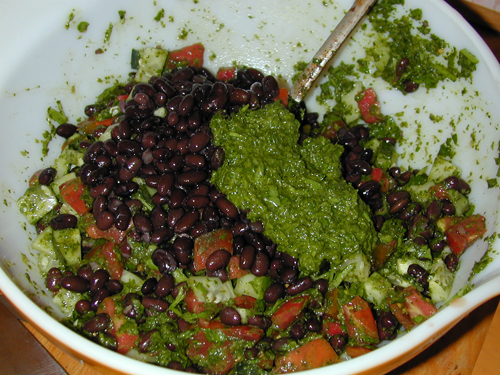 Chimichurri is a popular sauce from Argentina made with fresh green herbs (usually parsley, cilantro, and/or mint), garlic, acid (red wine vinegar, lemon, etc), and olive oil. Some recipes have other ingredients. It’s usually served on meat but I love it on fish, tofu, beans, salad, and all sorts of things. Since I’m not a garlic fan, I leave it out. It’s still amazing. My acid of choice is fresh squeezed lime juice. 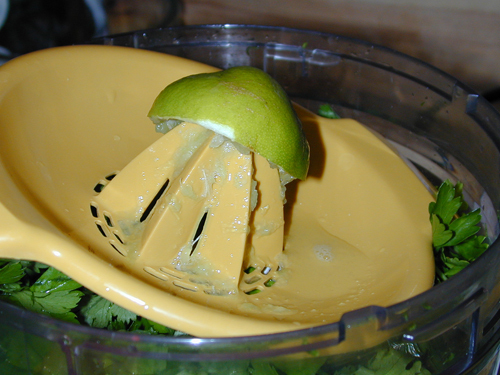 Not only is the flavor just right, but limes generally have no seeds, so it’s not too hard to make. Take any parsley or cilantro bunches you’re using, twist off the bottom half of the stems and discard into the compost. Then wash the remainder very well (cilantro in particular tends to hold dirt) by swishing and lifting out of a bowl of clean water, three times. Pull mint leaves off and discard stems. Shake or spin dry the herbs and put most of them (maybe 3/4) into the food processor. Add the lime juice and some salt. Note that the amounts given here are approximations. Bunches vary in size and so do limes. Each of them vary by water vs flavor. There is just no way to know exactly how much lime juice or seasoning you’ll need. So start with 3 limes and add 1 or 2 more if needed after you taste. Start your salt amounts on the low side too. I like a teaspoon or so of cumin (the seeds are best but powder is good too) and some mild heat. Sometimes I use chipotle powder, other times I use chili flakes. All depends what I’m in the mood for and what’s on hand. If you want garlic, use fresh peeled cloves. Rough chopping will help your processor out but is optional if you have a good one. I’d use 2-6 cloves in this recipe, depending on how much you like garlic. Process until smooth and taste. Adjust lime juice, salt, and seasonings. Repeat until it’s perfect. Now, drizzle in the olive oil and process lightly. Use more or less if you wish. Finally, add the leftover herbs and pulse the processor so they are well chopped but still have texture. If you’re using a processor that can’t do this well, or you are using a blender, then do the chopping by hand and add the minced herbs at the end. This sauce lasts several days in the fridge and you can use it to punch up just about anything. It’s great with mashed avocados, browned extra firm tofu slices, firm white fish, or on crackers. But one of my favorite ways to use it is in a bean salad. Here are two different recipes. I used black beans and lentils in this dish, but you can substitute any legumes you wish. Be sure to cook them so they are done but still firm. If they are mushy, you’ll end up with bean dip, not bean salad. I cooked the beans and lentils separately (though in the same pot) so I wouldn’t risk having to overcook one. Feel free to cook them together if you’re better with timing than I am. Cook until done but firm, drain well (liquid is great for soup stock (freeze it) or put on plants outside). Cut peppers in half, remove cap and seeds and slice into thin strips (cut in half if more than 3″ or so). Put on baking dish with a touch of olive oil and bake until soft. I did 25 mins at 350*F in a convention oven. If you use a regular oven, stir them every 5-10 mins. Add peppers to beans, stir lightly, and add the chimichurri sauce. Mix in sauce. Serve warm, at room temperature, or chilled. Variation: for a bit of spice, make some of the peppers medium heat ones and cut fine (leave some peppers large and mild) or add hot pepper to the sauce. Dice the cucumbers and tomatoes and add to the beans. Add the chimichurri sauce. Mix and serve at room temperature or slightly chilled.